The origins of the pressure washer go all the way back to 1927 when an engineer called Frank W. Ofeldt II came across the idea while tinkering in his garage. He noticed that when he directed the steam outlet of the device he was working on downwards, it moved the dirt and grease around on the floor. This discovery led him to develop and sell the ‘Hypressure Vapor Spray Generator’ with a man named Frederick E. Schuchman Sr. The name was later changed to ‘high pressure Jenny’ and even today pressure washers are sometimes referred to as ‘steam Jennies’. Later in 1950 Alfred Kärcher developed a hot-water, high-pressure washer and founded one of the longest running and well-known companies in the pressure water business. Things have obviously come a long way since 1927 and today’s market is filled with numerous variations of pressure washers. For example, there are cold and hot water variations, pressure washers powered by petrol or running on electricity, some are mobile while others are stationary. All these coming in a wide choice of sizes, power outputs and being armed with a myriad of features. In this article, I’m going to talk about the different types available, what is good and not so good, what they are suited for, and what you can get in selected price ranges. I will also choose a few from each category to review for you so that you can choose the right pressure washer for your needs and budget. Before all that though, let me begin by briefly explaining how pressure washers work, and then we’ll take a look at some of the main manufacturers making these machines these days. Pressure washers, power cleaners, steam Jennies. No matter what you call them, they work in the same way and are comprised of the same basic parts- A motor (whether it be petrol, electric, hydraulic or other type), a high pressure water pump, and a high pressure hose. Low pressure water enters the machine, the motor powers the pump that then send the water through the hose and nozzle, and high pressure water comes out of the end. Simple but very effective. Now let’s find out a little bit of information about a few of the big names in the pressure washer game. Karcher– Karcher is probably the number one pressure washer manufacturer in the world today. As mentioned earlier, its founder Arthur Karcher invented the first hot water power washer in 1950, 5 years after the company was originally founded. These days it’s a company turning over billions each year and employs over 12,300 employees in 67 countries but still remains a family run business. 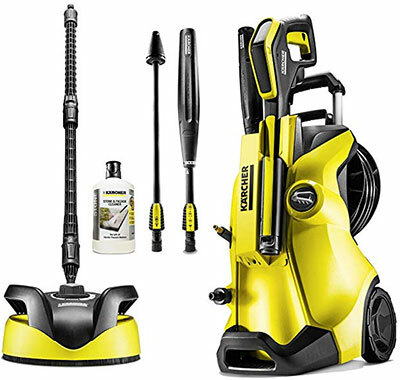 Karcher has a huge range of cleaning systems, products and services for use in the home and for industrial purposes. Nilfisk– Established in Denmark in 1906, Nilfisk have been around for a very long time. They were the creators of Europe’s first electric vacuum cleaner in 1910 and have since grown into a huge international company offering products and services for the cleaning industry. Like Karcher,they have a wide range of pressure washers on sale and available from many different outlets. As well as the three brands above, there are many others worthy of a mention: Honda, Troy-Bilt, Generac, Simpson, Ryobi, Craftsman, Dewalt and Greenworks are all reputable names that produce good products. But, what is the best pressure washer? Well, there is no straight answer to that as different types suit different purposes. Later in this article I will give my opinions for the best pressure washers for multiple categories, but first let me explain a bit about the pros and cons of the various types available. I’m going to begin with cold and hot pressure washers. Cold pressure washers are the type you most commonly see people using at home and with good reason. The initial cost is generally much cheaper than the hot water kind because their simple design cost less to manufacture. Another bonus of this is that there are less things that can get worn or break down so you save on maintenance costs too. Their simpler design means that this type of pressure washer is the easiest and most straight forward to use. Because there is a lot of competition on the market for cold water pressure washers, they tend to come with a lot of accessories included such as patio cleaners and different lances and nozzles. These all vary in effectiveness and quality but it’s not hard to get yourself a good cleaning package at a decent price if you shop around a little. Cold water pressure washers tend to be available in higher pressures than their hot water counterparts as the lack of heat means they need that extra power more. When it comes to most everyday cleaning purposes, such as washing dirt of the car or driveway or spraying water onto windows to get dead bugs off, a cold water pressure washer is more than capable, but for tougher to shift problems like oil patches and stains or grease, They are not the best choice. Hot water cleans better than cold. Anyone who has ever washed the dishes after a large meal will surely attest to that. The reason is twofold but fairly simple: Firstly, let’s just talk about cleaning what we can see, be it dirt, oil, grease or whatever. Whenever you heat something, the molecules that make up that particular thing start moving around faster and with more vigour. In the case of oil, this increased activity of the molecules makes it easy for the oil to be removed from the surface it is stuck to. The second type of cleaning that hot water pressure washers provide is the type you can’t see- Hot water kills germs and bacteria that just wouldn’t be affected by cold water. This makes hot water pressure washers a good choice for places like large kitchens where the need for sterilisation is very high. Rooms cleaned with hot water power washers also have the added bonus of drying faster than when washed with cold water as hot water evaporates faster. The downsides to hot water pressure washers are that they a much more expensive than the cold water models, they tend to be bigger and heavier, require more maintenance, and you definitely have to be alert and safety conscious when using something that can heat water to extreme temperatures. With hot water pressure washers, there is the extra cost of fuel to think about. Even electric hot water washers use diesel to power their heaters so it’s something to keep in mind when deciding on which type you’d like to purchase. Now it’s time for some reviews. 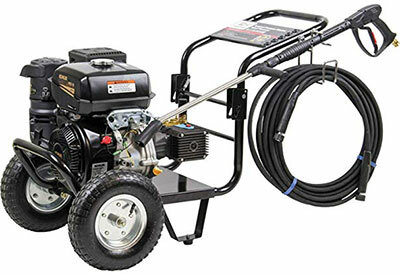 I’m going to start with cold water pressure washers first and review two different models in 3 different price ranges. When I’ done with those I’ll do reviews for different types of hot water washers. The first two machines are pressure washers that can be bought for under 100 pounds. The Bosch EasyAquatak 110 (yes that is supposed to be one word) is an electric cold water pressure washer available for 87.87 on Amazon. Powered by a 1300 watt electric motor that supplies 110 bar of pressure, it is more than able to tackle most home cleaning tasks like cleaning the car and washing out the driveway. The design is simple, easy to use and compact. A nice thing is- everything has a specific place on the main unit, so packing up and storing this pressure washer away is really easy and saves space. You won’t be breaking your back lugging this little machine around either, as it only weighs 3.8 kilograms. You can quite easily carry it in one hand while carrying the hose in the other. This budget Bosch pressure washer comes with 3 different nozzles- a rotary point jet nozzle for shifting stubborn or hard clinging dirt, a flat jet nozzle, and a foam nozzle for using detergent. All of these are push-fit connected and easy to set up and there is even a place to hold the lance upright on the main unit so you don’t have to lay it down while you aren’t using it. A simple thing, but a nice touch. 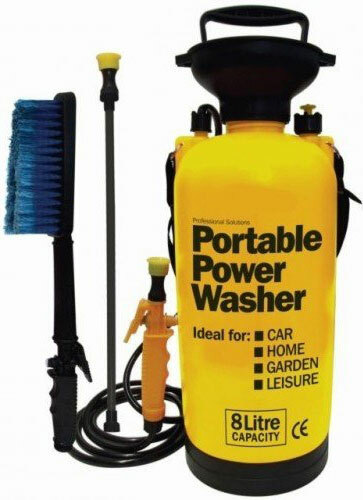 When it comes to range, this cold water pressure washer’s 3 metre hose and 5 metre cable should be adequate for most small to medium properties and cars, but if you have a larger house with a large drive or you drive a van or truck, you’ll need to use an extension lead or invest in a larger pressure washer. The Bosch EasyAquatak has an auto stop system which stops the pump when you aren’t using it, saving on energy, a good thing in this environmentally conscious era. 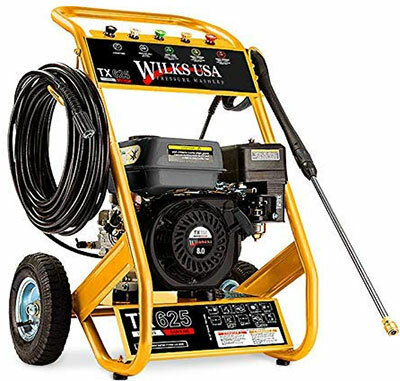 Reviews for this cheap yet well performing cold water pressure washer have been overwhelmingly positive with many customers giving it five stars. However, you can’t please everyone and some have complained about the fact that the lightweight design means that the main unit can be pulled or knocked over easily. Others thought that the foam lance didn’t perform as well as they wanted and the detergent bottle wasn’t big enough. Some also complained that the cable could have been longer, but, while a longer cable would always be appreciated, 5 metres is fairly standard for a pressure washer in this price range and a longer cable wouldn’t pack away as well. In summary, the Bosch EasyAquatek is a great choice for under 100 pounds as long as you’re not planning on cleaning a very large space or doing industrial work. The K2 full control pressure washer from Karcher is priced at 90 pounds with free delivery in the UK. 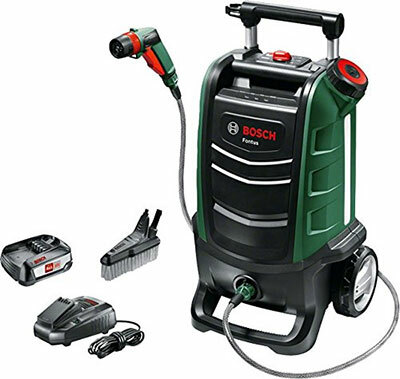 Like the Bosch model above, it is an electric cold water pressure washer , powered by a 1400 watt electric motor and produces 110 bar of pressure. With dimensions of 49 x 29.3 x 25.8 cm and weighing just under 6 kilograms, it is bulkier and heavier than the Bosch EasyAquatek, but has been designed with a different idea in mind. While the ultra-lightweight Bosch is supposed to be picked up and carried around, the Karcher K2 pressure washer comes with a telescopic handle on the top and wheels on the bottom, so you can tilt and push or pull it around similar to how you move a suitcase. Mix -This is used for applying detergents and is the lowest power setting. Soft- This produces a wider, less powerful spray that is good for cleaning surfaces that are easily damaged. Medium- This is the setting for most of your general cleaning tasks. Hard- This setting produces a powerful narrow jet spray, good for cleaning dirt that has built up. When using the ‘mix’ setting, the Karcher K2 will draw the detergent from the bottle itself via its on-board suction tube. This model also comes with an easy to hold power-spray gun attachment, giving you nice control over where your spray is going. Just aim and shoot like you’re using a handgun. Like the EasyAquatek, this pressure washer has been designed with on-board storage for the components to make storage as easy as possible. The dirt blaster, vario lance, power gun, hose and electric cable all have their own places to be packed into and hung up. Also, like its counterpart, the K2 has a stop-start motor for saving power. 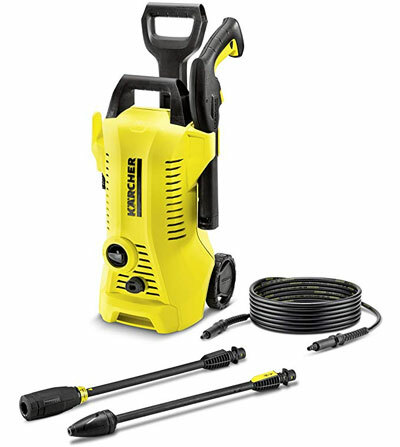 Range-wise, the Karcher is similar to the Bosch cold water pressure washer, with the same 5 metre power cable but with a slightly longer 4 metre high pressure hose. 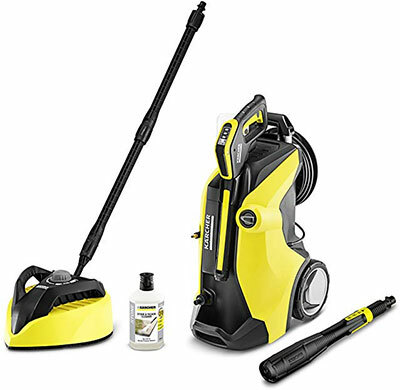 Criticism for the Karcher K2 has been aimed at the build quality of the main unit, which some people have said feels cheap compared to older Karcher models, and there has even been a complaint or two about it leaking. The pressure when using a patio brush accessory has also come under scrutiny. Like the EasyAquatek, it lacks range. In conclusion, The Karcher K2 cold water pressure washer is another budget model that, despite having a few flaws, is still a nice option for under 100 pounds. Our next set of reviews are for pressure washers under 300 pounds. The Karcher K4 premium pressure washer is the bigger brother of the K3 model reviewed above and, as expected, it is bigger, heavier, more powerful and more expensive. This model’s measurements are 58 x 50 x 49cm and it weighs 11.9 kilograms, which is actually fairly light compared to some cold water pressure washers in the same range. The K4 premium has a water-cooled 1800 watt electric motor helping to produce 130 bar of pressure and a maximum water flow rate of 420 litres per hour. Karcher are confident in its lifespan and have given it a 5 year warranty. The K4 cold water pressure washer is a mobile, fully upright unit that gets about on its 2 robust wheels when pulled by the top handle. The handle itself is telescopic, made of hard wearing aluminium, and works well. As with the K2 model, this power washer has the ‘full control’ feature allowing you to select the power mode you require. This model, however, has a power gun that comes with an LCD display showing you exactly what mode you are currently in so you can make the necessary adjustments for the job at hand. Like its little brother, this pressure washer is designed for easy storage and there are spaces on the main unit for all external parts to be stored away. The k4 premium also has the added feature of a hose reel to make packing up that 6 metre hose just that little bit easier. Another nice feature on this particular pressure washer is the plug and clean system. This system allows for detergent to be inserted in the top quickly and easily. This pressure washer feels much more powerful than the two we reviewed under 100 pounds. It is more than capable of blasting away thick moss off patios and cleaning large vehicles. There is a non-splash nozzle that does work well and reduces splash, but at the cost of power. This model also comes with a patio cleaner. The Karcher K4 premium pressure washer is quite easy to set up, but the instruction manual is more of an international, image based type without much text. Unfortunately, while most things have been upsized in this model, the power cable still remains at 5 metres, so you may need to invest in an extension lead. While the hose on this model is longer than on the Karcher K2 pressure washer, it is not by much and I would have liked to have seen a bigger upgrade. The hose itself is a bit stiff too and tries to coil itself up when stretched out and can be a little annoying. The Karcher K4 premium is a well-designed powerful piece of kit with some nice features and a couple of minor flaws. It would be a good choice for someone looking to spend 300 pounds on a cold water pressure washer. We are going to cheat a little bit for our next review as the price tag is just over the 300 limit at 314 on amazon, but shopping around could get you it under that so I’ve included it. 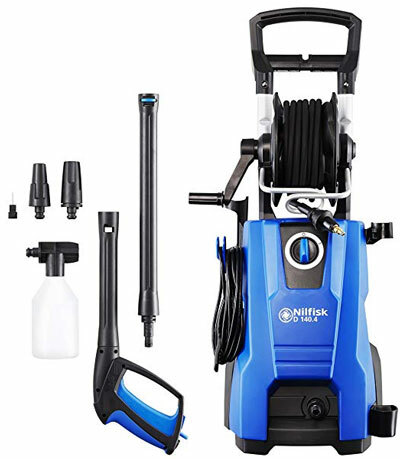 Nilfisk is one of the longest running pressure washer brands and is well known for consistently producing powerful, well made machines, and the Nilfisk D 140 is no exception. Running on a long-lasting 2400w motor, this model is capable of pumping high water flow of up to 550 litres per hour at 135bar of pressure. This ensures a great cleaning performance, and with the pump being made of a hard wearing, rust resistant, aluminium, that performance is sure to be upheld for a long time to come. This cold water pressure from Nilfisk weighs 13kg and measures 39.5 x 34.5 x 87.5 cm, so while it is a little heavier, its dimensions make it feel more streamlined than the Karcher K4. Plus, the extra weight makes the Nilfisk sturdier and less likely to be pulled over. The blue and black colour scheme works well and, personally I prefer it to the yellow of Karcher’s models, but the design of this Nilfisk pressure washer just looks a little blocky to me. That been said, it does feel well built. Included with the main unit are various attachments. There is the power speed nozzle, the variable speed tornado nozzle, a jet cleaning tool, and a click and clean foam sprayer. All of these click into place with no bother at all and can be released at the press of a button. However these nozzles don’t really have clear indicators so you have to double check that you have the right one before using or you might end up damaging something like your car paint. In addition, there is a trigger lock on the sprayer handle for extra safety and the connection between the handle and the hose is designed to swivel so that the hose doesn’t get twisted. A nice little feature. Also in the box is a 9 metre hose, which is much longer than that of its K4 rival and the hose reel on the main unit seems to work better than its competitor but still has its faults. If you’re not holding onto the main unit firmly while winding in the hose, it can pull it over. At 5 metres long, the power cable is the same length as the Karcher though. Like the Karcher K4, this Nilfisk pressure washer gets about on sturdy wheels and can be pulled by the telescopic handle. There are places for everything to be packed away on the main unit for easy storage. A common thing these days is for products to come without instruction manuals in the box forcing you to look online, or the instruction manual is mostly (or completely) picture based with very little to no written instructions. The Nilfisk D140 also suffers from this image rich instruction trend. To conclude, the Nilfisk D140 delivers a lot of cleaning power and offers some nice design features such as a long hose. Poor instructions and indicators let it down slightly. Ok, time for our last two reviews in this cold water pressure washer section. These next two are for machines under 600 pounds. Karcher again?? I hear you say. Yes, I know I’ve chosen Karcher pressure washers for each of the price ranges, and no I’m not on commission from them. Putting it simply, there are reasons that Karcher is the biggest name out there, and the K7 premium is definitely one of them. The Karcher K7 shares a lot of the features that make the K4 such an outstanding product. For example the LED ‘full control’ spray handle giving you control over the water pressure output with a press of a button, and the top loading, plug and clean system that simplifies the addition of liquid detergent. It also has the same quick fitting connecting system for the vario lance and the dirt blaster attachments, the same easy storing of the components on the main unit and the same way of moving around via the high impact wheels and telescopic handle. So what’s the difference between this Karcher pressure washer and its little brother, the K4? Power. The K7 model is fitted with a water-cooled 2400 watt electric motor. This feisty little lump helps to produce an impressive 180 bar of pressure and a water flow output of 600 litres per hour. The K7 power washer is classed as a cold water washer but this model can actually use water up to 60 degrees, this allows you to use a hot water tap should you have one outside. This combination should seriously cut down the time and effort needed to tackle any cleaning jobs and can clean up to 60 square metres per hour. The K7 is obviously larger and heavier than the K4, but it is also much sturdier. This model has a lower centre of gravity thanks to a wider footplate, and the hose guidance system has been redesigned, placed lower down on the main unit, and works much better than Karcher’s smaller model. Karcher’s K7 power washer has also been given more range thanks to a 10 metre long high pressure hose. The power cord remains at 5 metres. Another noticeable improvement is the T450 patio cleaner attachment. It has a triangular shaped, cleaning head that makes it much easier to get into and clean tight corners. The T450 also has a great little feature of 2 buttons on top of the head that changes washing modes. These buttons can be pressed with your foot which is very convenient. The power of the patio washer can also be adjusted by simply turning a knob, again a clever little addition. The main drawback of the Karcher power washer is its high price. Yes, it is powerful and cleans well, but these days you can get a petrol powered washer for around the same price which would give you an even more impressive output and wouldn’t be restrained by the power cable. In short, the Karcher K7 cold water pressure washer is the best in its class. There simply aren’t any other electric pressure washers in the same price range that offer the same amount of features matched with performance. The AVA P80 has a nice aesthetic design and the matt black and yellow colour scheme is understated yet still eye catching. 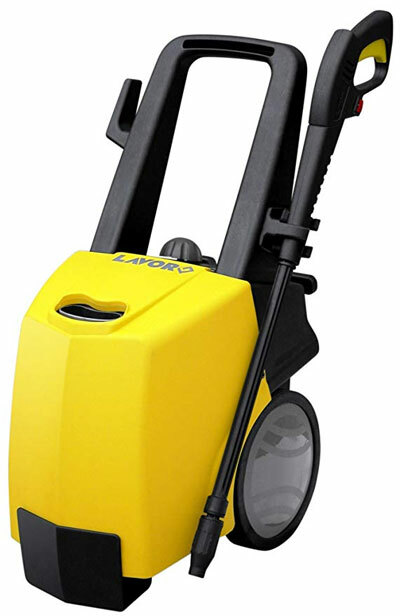 This model has similar features for transportation as the Karcher K7 pressure washer- nice big wheels and a telescopic handle. A 2800 watt electric motor gives the AVA P80 a pressure output of 160 bar and a water flow of 600 litres per second, the same as the K7. The pump is a 4 cylinder all metal design that is made to last. Zoom lance- Winner of a red dot award in 2018, this is the only adjustable lance on the market and was designed to tackle the problems and uncomfortable body positions that we sometimes find ourselves in when using short lances. Foam cannon- The AVA foam cannon has a 1-20% dilution adjustment. This means that you can use chemicals requiring high concentrations with it such as algae remover. It also has the ability to be compatible with any soap bottle thanks to its standard threads. The foam produced is supposed to be viscous and stick on surfaces longer to aid cleaning. Turbo nozzle- This fits onto the zoom lance and is supposed to be used on hard surfaces. It sprays out in a20 degree cone. Vario nozzle- has both a 20 degrees and 60 degrees spread. The latter is for cleaning fragile surfaces. Fixed nozzle- This is a short nozzle with a fixed 15 degree spread. It is used with the zoom lance and is designed to help with cleaning efficiency. Patio cleaner- For use on large surfaces. It has a fixed height and high performance comes from brass nozzles and spindle. All of these attachments are connected to the pressure washer’s high pressure gun via AVA’s quick connect twister system. Just push and twist to both connect and disconnect. The P80 power washer’s attachments all have a specific space for on-board storage. One of the best features on this power washer is the hose. It is 10 metres long giving plenty of cleaning range and is steel reinforced so it doesn’t kink or twist. This is paired with the P80’s ‘follow me’ hose reel. This reel adjusts to your position by pivoting and thus makes the unwinding of the steel reinforced hose easier and more efficient. Together, these features are a winner. In conclusion, this pressure washer has some great ideas and innovations such as the steel reinforced hose, but it doesn’t have the strong brand history that the karcher has going for it. That’s the last of our cold water pressure washer reviews. Now it’s time to move on to reviewing the hot water variety. In this section, I will only review electric/diesel hybrid pressure washers as I’ll dedicate a section to petrol powered washers later. The cheapest electric hot water pressure washer available on Amazon is the Lavorwash advanced 1108. The manufacturer ‘Lavorwash’ has a wide range of models available but at 514.99 this one is by far the cheapest. The Lavorwash advanced 1108 has a 2300 electric motor but also requires diesel in order for the boiler to heat the cold water from your tap up to the working temperature of 90 degrees celsius. The diesel tank can hold 8 litres, so enough to keep you going for a while. Although the overall pressure from the 3 cylinder pump is 145 bar, It has an operating pressure of 110 bar and a water flow rate of 450 litres per hour, so it is by no means an industrial strength pressure washer and is more suited to lighter tasks such as shifting oil stains off driveways. It has a basic, user friendly design and at 58 x 58 x 38 cm and 24kg, this hot water pressure washer is pretty compact and lightweight and gets about easily on a pair of decent wheels. The box contains the main unit, a spray nozzle, an adjustable lance which comes in handy, a detergent carton and an 8 metre long hose. Fairly basic, but what do you expect from the cheapest model available? Being a budget model, there is no pressure regulator and some customers have complained about having problems with this pressure washer blowing o-rings from time to time. You get what you pay for with the Lavorwash advanced 1108. 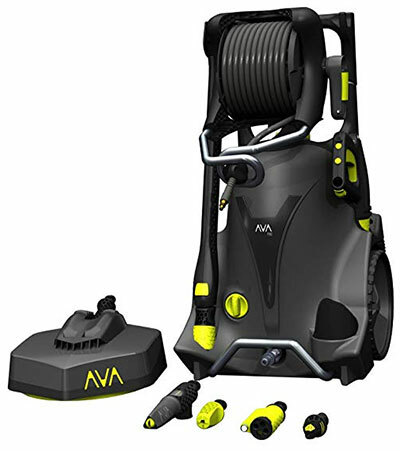 It is a basic hot water power washer with little in the way of features and accessories, but its decent performance make it a good choice for home use. This is my pick for best compact hot water pressure washer- Makita HW120. Like our budget choice above, the Makita has a simple design making it easy to use for the average consumer. This model sits somewhere between a home hot water pressure washer and a small job industrial washer. Compared to many industrial washers, it is indeed compact in size, but at 62kg, it is still quite heavy. Thankfully, it is fitted with 4 decent, centrally located wheels wheel so it can be pushed around the workspace. 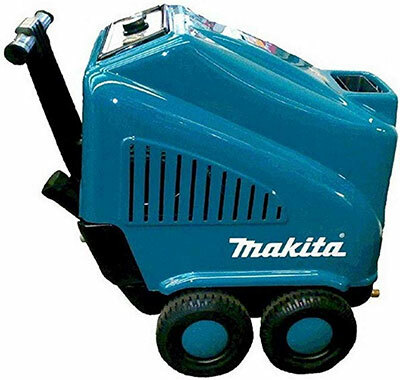 Powered by 240V, 1800W induction electric motor with 3 piston in-line pump, and using a diesel burner to heat the water between 30-90 degrees Celsius, this Makita hot water pressure washer can produce a flow of 510 litres per hour at 120 bar of pressure. The fuel tank’s capacity is 8 litres and the electric motor runs relatively quietly at 71 decibels. This model has Makita’s ‘total stop system (TSS) that enures the motor automatically stops when the trigger is released and water suction is switched off saving energy. Being a Makita, the build quality is good with ceramic coated, stainless steel pistons and gasket, and steel coated hose ensuring a good level of durability. This is backed up by Makita’s 3 year warranty. Feature wise, the Makita HW120 hot water pressure washer is pretty standard. It comes with a cleaning lance, 8 metre steel coated hose, and a single nozzle. Other accessories are available to be purchased separately. The water temperature can be controlled on the diesel burner and there is a water filter on the hose to protect the pump from dirt getting inside. High price for what you get. The Makita HW120 hot water pressure washer is basic but well-made and would be good as a powerful home-use washer or maybe suitable for light industrial cleaning that would benefit from its manoeuvrability over something larger. Staying with non-petrol powered machines, our next reviews are of portable and cordless pressure washers. Portable washers are small, very lightweight units that can be effortlessly carried around in one hand and some have very long power cords. They can be great little tools for home use, but for some reason there don’t seem to be that many to choose from, and although there are a few gems, some of them are really not worth putting your hand in your pocket for. Cordless pressure washers are the most mobile versions available. They run on batteries so there’s no need for a power cord. Not only does this mean you don’t have to worry about running out of cable length, it also means that there isn’t any chance of getting power cord snagged or twisted around something, giving you more freedom of movement. You will have to remember to keep the battery charged though try choose a pressure washer that has a good balance between performance, running time and charging time. Cordless washers tend to be a lot less powerful than their corded counterparts though and are only suited to small jobs like cleaning windows and washing dirt off garden furniture. That being said, there are a few models out there now that can produce the same amount of dirt-shifting power as an entry level, corded electric washer. Let’s take a closer look at a few cordless models that are on the market right now. Priced at only 18.99, the streetwise portable pressure washer is my choice for best pump action washer. Why is it so cheap? Because it doesn’t have a motor, instead relying on manpower to work the pump and create pressure. You simple squeeze two small buttons under the pump handle to release it, pump about 20-25 times to fill the pressure, then twist the handle to lock it in place and you’re ready to go. There is a pressure gauge to help you along. Don’t expect electric motor style power from this simple pressure washer but it does kick out about 40psi which is enough if all you are planning to do is clean windows or wash dirt of the bike and car. You can increase the cleaning effectiveness of this portable washer by filling it with hot water and some sort of detergent or car shampoo first, spaying the thing you intend to clean and then filling with water only to rinse off. The streetwise portable pressure washer holds up to 8 litres and there are water level markings on the side. However, I found it hard to see where the water was inside through the plastic and had to be in the right light to do so. The unit is very light at only 2 kilograms so you won’t be having too much hassle throwing it around. This portable pressure washer comes with a soft bristle brush and a long reach lance. The nozzle is adjustable between direct jet or fine mist. Obviously for such a cheap price there will be issues with the build quality and things may break over time, but it should last long enough for you to feel like you got your money’s worth. 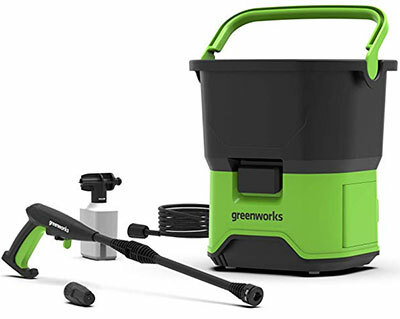 My choice for best powerful cordless pressure washer is the Greenworks 5104507 GDC40 DC Portable Cordless Pressure Washer, which I’ll refer to as the GDC40 from now on. Compared to most cordless pressure washers, this is a beast! The power pack for this model is a 40 watt lithium battery and the maximum pressure is 70 bar. That is much more powerful than the vast majority of cordless electric pressure washers and isn’t that far behind corded models. The water flow rate of 300 litres per hour is also very good for a cordless model. Measuring 37 x 46.5 x 43.5 cm and weighing 7.9kg, the Greenworks GDC40 cordless pressure washer is not going to take up too much space in your garage nor be a problem to lift and carry around. When packing away, the main unit fits inside the 20 litre water tank for efficient storage. The 6 metre hose fits easily on to the high pressure gun and the nozzle can be adjusted to different angles to suit your cleaning needs. The downside to this cordless pressure washer is it doesn’t come with the battery or charger. They have to be purchased separately and they’re quite expensive, costing more than the main unit itself. On the plus side, you can use the same 40V battery in other Greenworks products. However, make sure you get 4Ah batteries as this machine won’t run for long on 2Ah. Other flaws are that the lack of wheels can make it cumbersome when full of water, and the battery takes a quite a while to fully charge. This cordless pressure washer for Greenworks gets the power requirements right but lets itself down when it comes to the battery charging and operating times. Bosch have delivered us a great, yet comparatively, very pricey, bit of kit with their Fontus cordless pressure washer. Priced at over 240 pounds with battery and charger included, it is significantly more expensive than some other cordless pressure washers. Though with the extra expense comes more features as well as the Bosch brand name, build quality and aftermarket services. The Fontus outdoor cleaner’s battery is an 18 volt 2.5Ah lithium-ion that gives it a working pressure of up to 15 bar. That’s better than average for this type of pressure washer, many of its competitors have only 3-5 Bar of pressure. Still, when compared to corded pressure washers, it seems very underpowered. 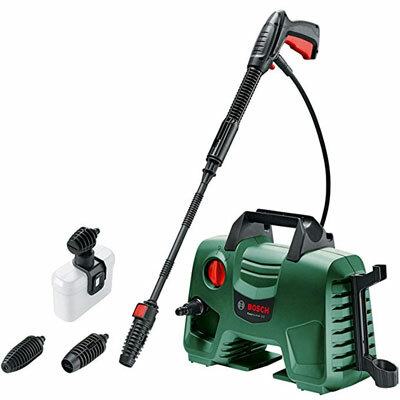 A good thing about this Bosch battery is that it can be used in other Bosch products, so if you purchase a Bosch lawnmower or chainsaw, you don’t have to buy a different charger, just use the same one that comes with this cordless pressure washer. Running time on a fully charged battery should be about 1 hour, plenty of time to wash off mountain bikes, garden furniture and any other small to medium sized jobs you have around the home. The 15 litre water tank is enough to clean 3 very muddy bikes before it needs refilling but it will still run out well before the battery. There are 4 adjustable spray patterns to choose from- The pencil get is the most powerful and is good for shifting things like lumps of mud or bird droppings. The 15 degree fan jet is meant for smaller surfaces and more precise cleaning. A 50 degree fan jet can be used for cleaning larger things and areas. A soft shower jet perfect for bathing pets. These 4 spray patterns added to the 3 pressure selections give you 12 cleaning options. Coming as part of the package is the smart brush that attaches to the 4 metre hose. This works really well on windows as the water flows out through the middle of the brush head and straight onto the part you intend to clean. The whole unit and accessories pack away easily and neatly in the provided compartments for storage and transportation. The Bosch Fontus gets 2 thumbs up for build quality and features, but the asking price is very high and you could buy a much more powerful corded model for the same price. For me, the best designed cordless pressure washer pick was a no-brainer. The Hydroshot cordless pressure cleaner from Worx is one of the most innovative designs on the market these days. Worx have done away with the main unit that is widely used by its competition and instead come up with a simpler more straight forward design. As already stated, the Hydroshot power gun doesn’t have a separate main unit to connect to. The battery simply clicks into the bottom of the gun as does the hose. All there is to do is to put the other end of the hose into a bucket of water and off you go. It doesn’t have to be a bucket though, you could use any water source you like- a pond or river for example. It runs on a 20V Ah lithium power share battery that can be used with other products from the same manufacturer. The Hydroshot is capable of producing 22 bar of pressure which is enough for most small cleaning tasks you’ll find around the home, such as cleaning out gutters or blasting patio furniture. The pressure output is changeable so it’s up to you whether you want more cleaning power or less power and longer usage. This cordless pressure washer comes with both a long and short watering lance, changeable in seconds thanks to the easy twist and click connecting design. The nozzle is adjustable and has five spray angles- 0, 15, 25, 40 degrees and shower spray. The dual use of the Hydroshot means it can be changed from cleaning windows to watering flower beds in no time at all. As with all cordless pressure washers, the main problem is battery life. The battery that comes with the Hydroshot won’t last very long even on low pressure mode. I’d suggest purchasing a 4Ah battery to give you more running time. Another drawback is the long charging time for the battery, about 5 hours. Only suitable for small jobs. The Hydroshot has great ideas and is a step in the right direction for cordless pressure washers, but it is ultimately let down by the battery life and charging time. That concludes all of our electric powered pressure washer reviews. It’s time to move on to petrol machines. Should you choose petrol over electric powered? Well, it all depends on what you intend to use it for. If you are only doing small to medium sized tasks at home, a decent, high powered electric model should be ample for you. On the other hand, if you are cleaning commercial or industrial properties or have particularly tough job at home to do that requires a little more ‘oomph’, you might be better looking at a petrol pressure washer. They deal with oil stains, chewing gum, grease and other hard to clean substances much better than electrical washers. Purchasing a decent petrol washer will almost certainly reduce the amount of time you spend on your cleaning tasks because of higher psi and maximum water flow available. While it is true that petrol pressure washers require you to perform some maintenance on them, if done correctly, they should keep performing well for years. Generally speaking, petrol pressure washers tend to have better build quality than electric models and feel sturdier. Good petrol engines from the likes of Honda, Hyundai and Kohler will give you years of good service if treated properly. The lack of need for a power cord means that petrol washers are more mobile and have much better range. There’s no need to go looking for the nearest wall socket. It’s one of the main reasons that they are great for industrial cleaning- high power that you can easy move around. One thing to aware of though, is that like cars, petrol pressure washers release fumes into the air, so they aren’t supposed to be used in places without good ventilation and working in confined spaces isn’t a good idea. The noise factor is also another thing to keep in mind if you’re thinking of going for a petrol model. Nearly all petrol pressure washers are louder than their electric counterparts and some of the cheaper models will definitely require you to use ear protection while using them. There is also the added cost of having to buy petrol and oil for the washer to run on which adds up over time. Petrol pressure washers are powerful, mobile and durable machines that are ideally suited to medium to large cleaning jobs and commercial use. For most people though, who only want to do a few little things in the garden, an electrical unit is just fine. Ok, review time. Here is a selection of petrol lawnmower review. They are, in my opinion, the best ones in their price range currently available in the UK. I hope you find them informative. Mine, and many other’s choice for the top pressure washer under 200 pounds is the..
For just 199.99 this petrol pressure washer can be yours for the same price as a mid-range electrical model but giving you so much more cleaning power. It runs off a 208cc 4 stroke engine that produces 6.5 horsepower and a maximum pressure of 3100 psi. That kind of pressure is on par with some much pricier models. This powerful jet washer makes light work of even the dirtiest driveways and patios. Despite the low price, it’s not only for home use, the Parker brand petrol pressure washer can be used for cleaning machinery and vehicles too. Being completely petrol powered, there is no need for a movement restraining power cord. Instead, you can move it around freely on its large and sturdy wheels to wherever you need it to be. This latest version of this particular pressure washer has been revamped and had a few features tweaked and upgraded. For instance, this new machine vibrates less than the old model, making it more comfortable to use for longer periods. The soft hand grips also help out in that department. There is also a new integrated soap dispenser. It’s easy to use, simply open the frontal tank, pour in your detergent, attach the soap nozzle and you’re ready to give your car that well needed bath. The nozzle can be adjusted to 5 different spray settings, from a concentrated pencil spray for blasting away stubborn grime, to the low pressure spray that is a better choice when using chemicals. If you are thinking in investing in the parker brand petrol pressure washer, (and at this price, why wouldn’t you?) there are a few things to keep in mind. 1. The machine doesn’t come with oil so make sure you go out and get some and top up before starting it. 2. There doesn’t seem to be an easy way to see the oil level in the high pressure pump, so you have to check with a good old fashioned dipstick. 3. Despite the improvements over the last version, this model’s engine still makes a fair bit of noise and vibration, so make sure all bolts are tightened up and wear ear plugs. Parker Brand have done themselves proud with their petrol pressure washer. It is cheap, very powerful and has some nice, if basic, features. The only real drawback is the noise and vibration from the engine. With the TX625 petrol pressure washer, Wilks have produced a great, value for money product. First of all let’s talk about the power. The 7 horsepower 210cc 4 stroke engine produces an insane amount of cleaning power- 3950 psi at 272 bar. You can clean pretty much anything with it and it will perform well. Brickwork, patios, driveways, vehicles, decking, you name it and the TX625’s power will be more than enough. Surprisingly though, all this power doesn’t come at the cost of fuel consumption. This petrol pressure washer does very well to keep your fuel costs down and the automatic stop-start pump ensures that you’re not using energy unnecessarily. It’s not all sunshine, the TX625 can be hard to start if you don’t follow the online instructions properly (you must pull the trigger to release water pressure) and like most petrol pressure washers, the engine runs quite loud. Maximum water flow is good at 720 litres per hour and you should be able to clean about 90 square metres in the same 60 minute period. The design is simple, but practical. The steel frame has places to keep the hose and lance and the different nozzles have their own easy to reach spots in front of the handle. A small design feature, but well thought out. The steel frame feels durable but I wish I could say the same about the powder coat paint which could have been better. At 32kg it’s not too heavy and can be wheeled around without too much hassle. The fact that this pressure washer comes with 20 metres of hose, an 8 metre and 12 metre that can be linked together, means that you shouldn’t have to move the main unit anyway. The only problem with the hose is that it is quite thin and can melt if it touches a hot surface or be prone to spring leaks, so you either need to be careful, or go out and buy a better hose. Like other Wilks products, the TX625 petrol washer comes with a host of accessories. There are 2 lances; the straight regular lance and the curves gutter lance. The latter being another nice little extra that really helps ease the difficulty of cleaning out your gutters, roofs and undercarriages. 1. A zero degree nozzle for blasting off stubborn materials. 2. A 15 degree stripping nozzle. 3. A 25 degree nozzle for regular cleaning. 4. A 40 degrees nozzle for washing down. 5. A detergent nozzle used for soaping things up. Another nice attachment that comes with this petrol pressure washer is the self-propelled drain cleaner. Just attach it to the hose, pop it down the blocked drain and let it do the work for you. If that wasn’t enough the TX625 also comes with a pipe and filter to use with detergent and another hose and filter that allows you to use a bucket, pond or river as a water source if there isn’t a tap nearby. All these accessories come as standard and don’t have to be purchased separately. However, one thing about having so many accessories, is you have to find space to store them all. Not a big problem but still something to think about. There are some minor flaws with the Wilks TX625 petrol pressure washer, but they are massively outweighed by all the positives. Great power, lots of innovative accessories and good fuel economy. All for under 300 pounds. A steal. Hyundai are best known for making cars but they also produce lawnmowers, power tools and pressure washers. 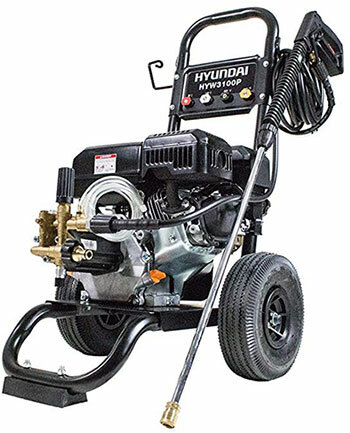 The main benefit with a Hyundai petrol pressure washer is that you know you can trust the engine as the company has been perfecting them for years. This model is fitted with a Hyundai 212cc 4-stroke, low emissions, unleaded petrol engine that is designed to be easy to start in all weather conditions, so it won’t leave you hopelessly pulling the starter cord of your petrol pressure washer on a cold winter’s morning. Also, because the engine has excellent mid-range torque, you don’t have to run the machine at full revs all the time. This has the added benefit of reducing noise, fuel costs and emissions and prolongs the working life of your motor. This petrol pressure washer is mains cold water and gravity fed, and can produce 2800psi and has a water flow rate of 8.75 litres per minute. The pump is a super reliable, Italian made annovi reverberi axial model with ceramic pistons and a brass pump head supporting the overall durability of the HYW3100P. The pump also has an unloader valve built in to it. This prevents overheating by regulating the overall temperature of the pressure washer. The build quality of the Hyundai HYW3100P petrol pressure washer is excellent. Everything feels solid and durable-the tubular steel frame, the big solid wheels, even down to the bolts and plastic parts. You just know that this thing was built to last, even with extensive use. Features and accessory wise, it’s not the most jaw dropping I’ve ever seen. It’s a fairly standard set up. This Hyundai pressure washer comes with a lance, trigger gun, 8 metre long hose, spark plug spanner and an instruction manual. 3. 40 degree wide spray nozzle is good for hosing down wider area that don’t take as much cleaning power. 4. And the soaper nozzle for applying you detergent. There is also a separate jet nozzle that really does a great job of removing grease, oil and grime. The only real problem found with this petrol pressure washer is the hose. It tends to kink quite a lot. Overall the Hyundai HWY3100P is a no nonsense petrol pressure washer. It is designed to give a consistently great cleaning performance for years to come but the lack of included features and accessories may bother some customers. If you’re looking for pure power, this is the washer for you. 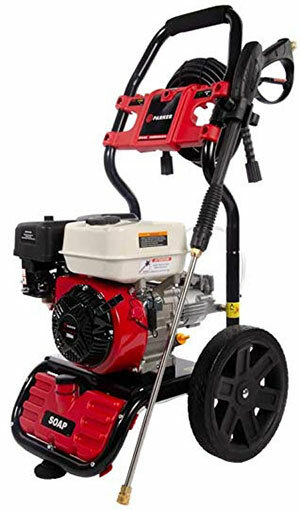 The engine powering this SIP pressure washer is an American designed, 14 horsepower (10.4 kilowatt) block made by Kohler. The engine comes with a 3 year warranty so you can be sure of its durability. The pump is a heavy-duty, hard wearing brass headed device, built in Italy. The engine also has Kohler’s Quad Clean durable cyclonic air cleaner to help keep contaminants out of the engine. This engine and pump help the SIP Tempest to kick out 4005psi (276 bar) of pressure and a very impressive maximum water flow rate of 960 litres per hour. These combined should make light work of pretty much any cleaning task you can think of, making it a great choice for professional cleaners or industrial type cleaning. Like the Hyundai model above, the SIP Tempest petrol pressure washer isn’t exactly brimming with extra features or attachments. It comes with a dual lance that has a protected swivel expansion and a 10 metre heavy-duty hose. The nozzle is adjustable. As for the main unit, the metal frame is sturdy and it has a space saving design for storage purposes. The powdered paint job is ok but nothing special. The te3mpest does have nice big pneumatic wheels to get about on though. To sum up the SIP Tempest. It’s very powerful and would be great at blasting away hard to shift substances and would certainly speed up the time it takes to blast a driveway or patio clean. Its downfall is the lack of any real features other than the most basic. Well, that concludes all of our pressure washer reviews in this article. I hope I haven’t bored you too much, but when you are dealing with specifications, it can be hard to find ways of writing about them without sounding monotonous, and without the specs it’s difficult to convey the differences between the products. I will end this article with some general tips for cleaning with a pressure washer. Always read the instruction manual, whether it be in the form of a book or online. Setting up or using a pressure washer incorrectly can be disastrous and could end up ruining your new toy before you’ve even used it. Be safety conscious. Pressure washes can be dangerous and cause injuries if misused. Be especially careful if using a pressure washer with high psi or one that heats water to scorching temperatures. You might think it’s funny to spray someone with a low pressure wide angled nozzle, but if you get it wrong and instead blast someone in the eye with a jet nozzle, they are not going to be happy on their way to the hospital. To reduce cleaning time, always pre-soak the area to be cleaned with a detergent or other cleaning chemical. If you are cleaning wood or other fragile surfaces, use a low pressure washer or at least a low setting and wide angled nozzle to reduce the risk of damage. If you are using a petrol lawnmower, be sure to check your oil before using it. It is easy to forget this little bit of maintenance but you will be replacing expensive parts in no time if you don’t keep the machine properly lubricated. You may need to use anti-freeze in winter too. If you really like a particular pressure washer but it doesn’t come with the accessories you want, take a look online for them to be sold separately. You might find them on sale or decent second hand ones may be available, saving you money. Use hot water whenever possible as it cleans better than cold water. Make sure you wash away the detergent or chemical before it dries. Make sure you have the correct nozzle fitted for the job at hand. Using a powerful jet nozzle can damage some surfaces and using a wider spray nozzle on hard to shift grease with either seriously extend your cleaning time or simply not do the job properly. For removing stains on surfaces try an aluminium brightener. If it’s a painted surface, you can use DNB 1430 before the aluminium brightener.